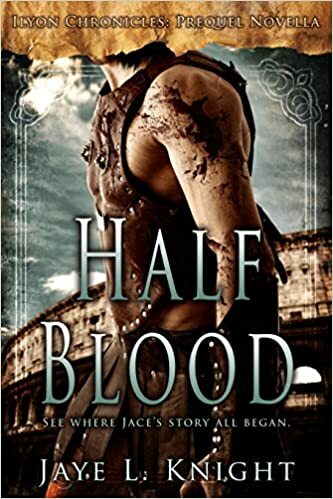 Jaye L. Knight’s new novella, Half-Blood, has been released! Learn more about this prequel story to Ilyon Chronicles (including my review and an interview with the author!) and make sure you also enter the tour giveaway at the bottom! Let me get the legal lingo out of the way, first of all: I received a complimentary copy of Half-Blood in exchange for an honest review. All opinions are my own. You may recall that I have already read and reviewed Resistance and The King’s Scrolls, Books 1 and 2 respectively in the Ilyon Chronicles series. Ergo, my expectations were high with the release of Half-Blood … and it did not disappoint. The cover itself is quite a bit different from Resistance and TKS, but by no means is it less stunning. Even looking at it now gives me a little bit of the chills – and not in a Lion King, hyenas-shivering-over-Mufasa way. No, this reaction is more a “GAH I KNOW WHAT’S COMING AND IT’S NOT EASY” shiver/chill. (</end capslock of doom>) By the time readers encounter Jace in the Ilyon Chronicles (IC, from here on out) series, we know he’s had a rough go of it. Really rough. So coming back to where it all begins with Half-Blood, the cover is a perfect lead-in to what you’re about to read. His early years ain’t pretty; it really is as bad as you might have imagined in IC. But I’m getting ahead of myself here; this paragraph, at least, is about the cover. Every time I look at it, I have flashbacks to movie posters like Gladiator. Or The Patriot. Or Braveheart. (None of which, ironically, I have seen. #thepowerofhollywood) Props to the designer – it’s evocative and emotional. Half-Blood is not an easy read. It’s certainly not fluffy. But I was not expecting that, either, knowing it was about Jace and his childhood. My heart ached for him; I wanted to jump into the story (perhaps Silvertongue from Inkheart could read me in?) and I could channel Harry Potter‘s Hermione, quickly performing a shield charm to prevent the whippings and the fights to the death. So much emotion in this story; I really had a hard time, both from the subject matter as well as the simple fact that two books and now a novella later, I have a vested interest/abject desire for this character to live, survive and thrive. The novella’s pacing is non-stop; something was always happening to move it along – but the plot does not suffer at all from that. The novella length was perfect to tell Jace’s story, without it being overdone – or, on the flip side, drawn out to fill time or a word count. That is truly how I feel I should wrap up this book review … as hard as it was to read aspects of Jace’s younger years, I love that it ended with hope. The novella absolutely lived up to my expectations, and I am looking forward to Jaye’s next IC book. Despair is not the end; hope and love will triumph! Meagan: Half-Blood is a novella set prior to Resistance. Which book did you write first? Do you think that helped or hindered the writing process? Jaye L. Knight: I wrote Resistance first. I only just wrote Half-Blood this past winter, though I did have a couple of scenes written long before that. I don’t think writing them out of order hindered me in any way. The only difficult part was making sure all the facts in Half-Blood matched what I had mentioned about Jace’s past in Resistance and The King’s Scrolls. We talked at The King’s Scrolls’ release about how hard it was to write certain plot points. I can only imagine how it must have been writing Half-Blood – between the gladiatorial action and other brutality, it was certainly not easy to read at times. How did you cope with the stresses of certain scenes? Thankfully, the story flowed really well and I wrote it in only a couple of weeks, so I didn’t have to dwell on any scenes too long. I think most of the stress for me came in wondering what reader response was going to be like. I have a tendency to get slightly depressed when I’m getting ready to release a new book as writer insecurities creep in. This was especially bad with Half-Blood because it is such a tough story, yet one I really wanted to tell because it’s what shaped Jace into the person he is in the series. What kind of research did you do for Half-Blood? Most research I needed for Half-Blood I had already done for the other books in the series. I’ve read quite a bit about gladiators and other gladiator stories over the last couple of years, so I drew on that. Thanks again, Jaye! 🙂 Looking forward to more in Ilyon Chronicles! Thank you for having me on your blog again! I always enjoy it. 😀 And I’m so glad you liked Half-Blood! Thank you, Jaye! 🙂 It was a pleasure, as always. Can’t wait for more in the Resistance series! Looking forward to reading your review! !